Ryorin's Ramblings: Girl Genius: Agatha Heterodyne and the Return of the Hugo Award! 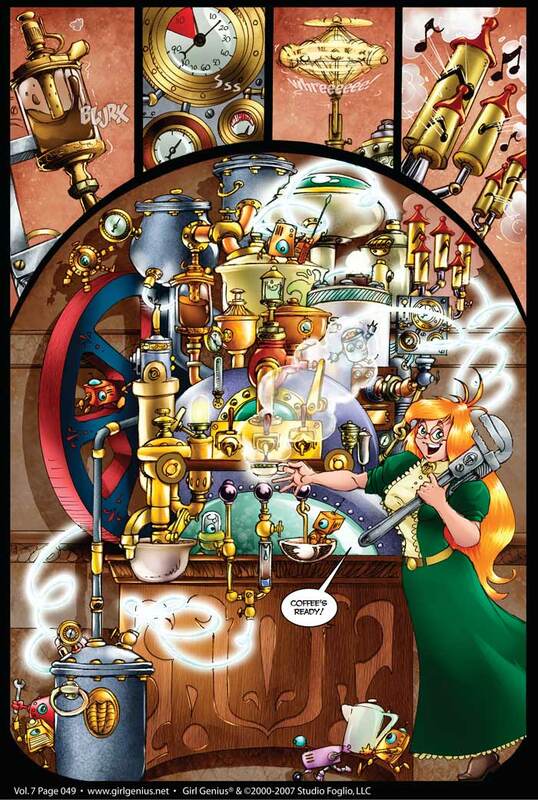 Girl Genius: Agatha Heterodyne and the Return of the Hugo Award! Adventure! Romance! MAD SCIENCE! These are the ingredients chosen to create the perfect little girl the story of Agatha Heterodyne: Girl Genius! Please excuse me for a moment as my joy demands to be released: Eeeeeeeeeeeeeeeeeeee!! Anyway, it is a world ruled by Mad Science! Failed experiments of mad scientists (more commonly known as "Sparks") wander the earth, dirigibles roam the skies, and mechanical "clanks" and Frankenstein-monster-like "constructs" are a common site. This is a world with lost cities, talking cats, rules of royal succession altered to account for reanimation, traveling theater companies that aren't quite what they seem, and cream pies with a strangely soothing effects. This world of brilliant color is also a world of many, many questions. And, of course, regularly twisted laws of science. It's a wacky adventure story (filled with romance and Mad Science too, of course...) set in a wacky, yet amazingly complex world, populated by amazingly fun characters and amazingly ridiculous machines. Writer and co-creator Kaja Folio accidentally coined the term "Gaslamp Fantasy" to describe this world, and it fits perfectly. It takes the steampunk aesthetic, adds gobs of Mad Science and elements from fifties-style pulp sci-fi (think "Captain Proton" from Star Trek: Voyager) and buckets of Vernian influence, mix in liberal doses of humor and great characters, sprinkle in just the amount of explanation about the world and it's history, and then hand it over to the colorist for the final touch. For a simplified version of this recipe, see the top of the page (you know, the part that starts with "Adventure!" and then mentions "Romance!"). At ten-and-a-half volumes, this series is going strong, and I really don't see it slowing down anytime soon with so many questions left unanswered (I'm not going to try to list them off; you'll have to read the series and see for yourself)! 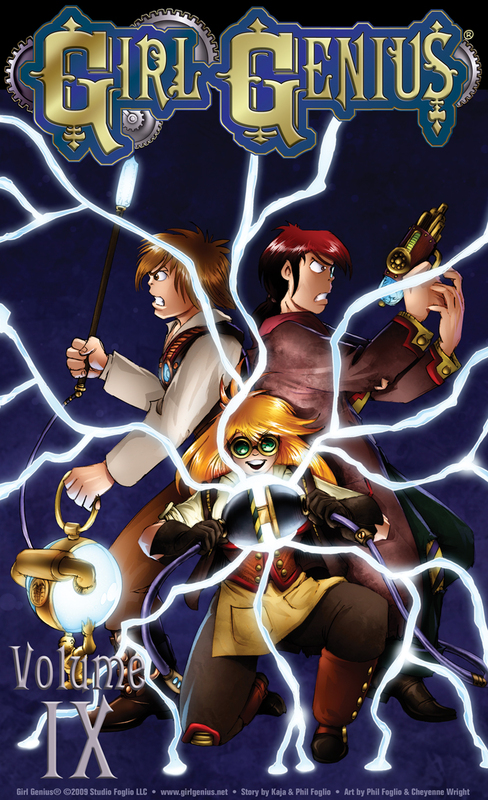 The story focuses on Agatha, a, well, a Girl Genius. A young student who can never get her clanks to work, she... well, she turns out to have a lot more to her than anyone thought. 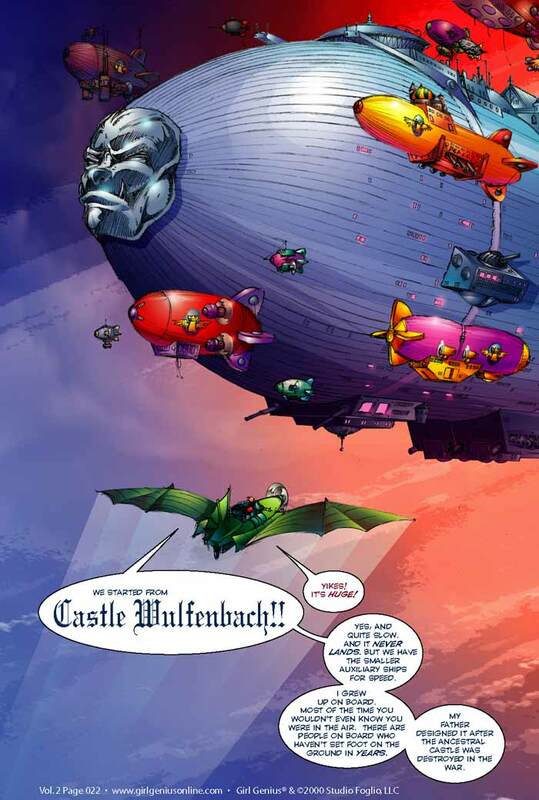 She ends up on a grand adventure spanning, airship cities, maniacal circuses (of doom! ), insane talking castles, theater, and situations that only a good death ray (or a carousel) can solve, to avoid being manipulated or killed. Or turned into a "spunky girl sidekick." Hi-jinx ensues, and it brought friends. Agatha herself is an incredibly fun character, willing to tackle challenges even when her concentration is inhibited at the beginning. What's she do when she's mugged? She hits the attacker with a bottle. And when she's given the impossible task of cleaning the lab before the Baron arrives for a surprise visit in half an hour? She does it. After the story really starts, well, then she goes from great to incredible. As for the rest of the cast, it's tons of fun and filled with great characters. From the lazy Krosp, the Emperor of all cats, to the fun-loving warrior Zeetha, lost princess of the Lost City of Skifander, to insane pirate Bangladesh Dupree to Baron Wulfenbach, the tyrant with very good reasons for his actions, to... well, you get the idea. I adore Girl Genius. The characters, the world, the technology, the mysteries, the humor, the art, the visual gags ("Turnips R Us"), the massive eyebrows... the concepts are great and the execution is wonderful, and they get extra points for pulling off a fun love triangle without angst. Now, that's awe-inspiring. This is a genuinely fun series that I highly recommend to all, though I must add that the Foglios have self-rated the series PG-13. I really doubt that I can do the plot justice (at least not without heaps of spoilers and few more weeks of editing), so lucky for us all the Book Smugglers posted their review of the first three chapters less than twenty-four hours ago. Check it out; maybe the review and my rambling combined can come close to doing this lovely series justice. Follow This Elegant and Finely Crafted Link to Read! Note to self: add the color version of Volume 1 to my birthday list. For more fun, there's also Girl Genius Radio Theater, which is a pod cast of two comedic three-part episodes and one promo, done in the style of an Olde Tyme radio serial. Oh, and the "Elegant and Finely Crafted Link" phase is commonly used at the Girl Genius website, something that should give you the tiniest taste of the Foglios' brilliance. No, I really can't praise them enough.